30 | January | 2017 | GameXcess.net - Gaming News, Videos and Editorials! Posted by Maniac in Reviews. The number one Christmas boutique gift item this year had to be Amazon’s line of Alexa powered speakers, the Amazon Echo and the Amazon Echo Dot. I know a lot of people have asked me about these devices, as they can do a lot more than other Bluetooth speakers. They feature access to an internal personal assistant named Alexa, a program which is capable of everything that Apple promised Siri could be, and a lot more. She has amazing voice recognition and can understand tons of direct queries including time, weather, news, and basic information. She can also play music from Tune In, Pandora or Amazon Prime (provided you have an account where applicable). Well first off, thank you for asking, I appreciate the fact you feel comfortable coming to my website for that kind of information. Pull up a chair. Next I’d like to say that this is only a review of the devices themselves and not the Amazon services which can expand Alexa’s features like Audacity, Amazon Prime or Amazon Music. If you already subscribe to those services you can do more with your Echo or Echo Dot, but they are not required for the devices to function. So with all that out of the way, let’s get started. Let’s talk first about each device’s appearance and design. 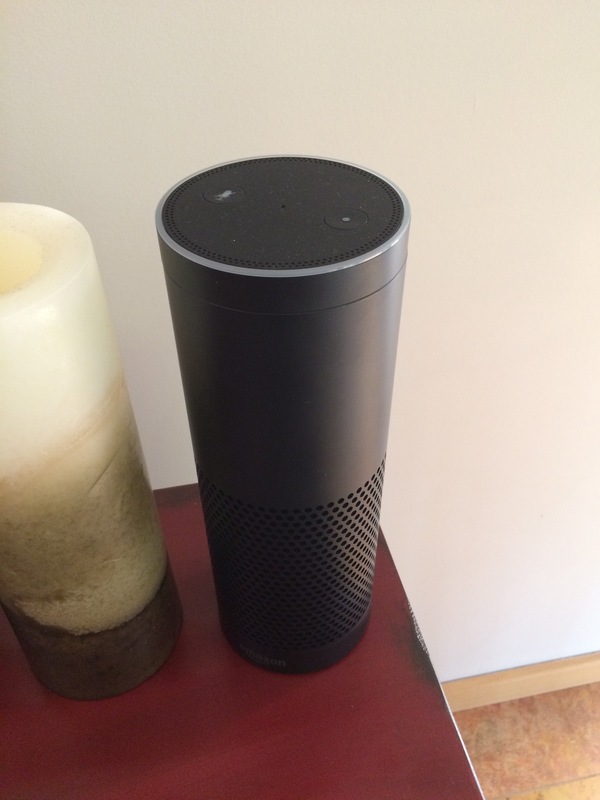 The Amazon Echo is slightly wider than the width of an aluminum can and about the height of a candle. It has only one input for its power adapter, and features a mute button and a pairing button on top. Volume control is handled by an integrated dial on top of the speaker, which I absolutely love. The rest of the device is taken up by an omnidirectional speaker. The Echo does not have a battery so it will deactivate when unplugged. The Echo Dot is much shorter than the Echo, but it is still about the size of a hockey puck. It has a USB power input and a standard audio auxiliary out on the bottom of the device, and has the mute and pairing buttons on top. Sadly, the Echo Dot has no volume dial like the Echo, instead there are volume up and volume down buttons on top of the device next to the mute and pairing buttons. The circular light on top of both devices glow different colors depending on what it is currently doing. It will glow blue when receiving a query with the brightest part of the light shining in the direction of its user’s voice. That way the user knows who Alexa is listening to at that moment. You will see a white light when adjusting volume, and the light will get larger around the top of your device as it reaches maximum loudness. If there’s a problem during setup, it will glow purple. Edge goes to the Amazon Echo, while the light indicators on both devices are identical and the Echo doesn’t have an external speaker output, its own speaker is awesome and I freaking love that volume dial. Next let’s talk about setup and installation. To set up the Amazon Echo or the Echo Dot, you’ll need an internet connected WiFi router, an Amazon account and a SmartPhone or Tablet compatible with the Amazon Alexa app. The process of connecting your speaker to a WiFi hotspot can be a bit complicated, so make sure you remember your WiFi password. I set up the full sized Echo using my Dad’s iPhone 5 early Christmas morning. I don’t know if it was my dad’s old smartphone, a buggy app, or the fact that it was Christmas morning, but it must have taken at least four attempts for me to connect the Amazon Echo to my WiFi router. When I tried to set up three Echo Dots on a different hotspot later on that night, the process was extremely smooth with no errors. 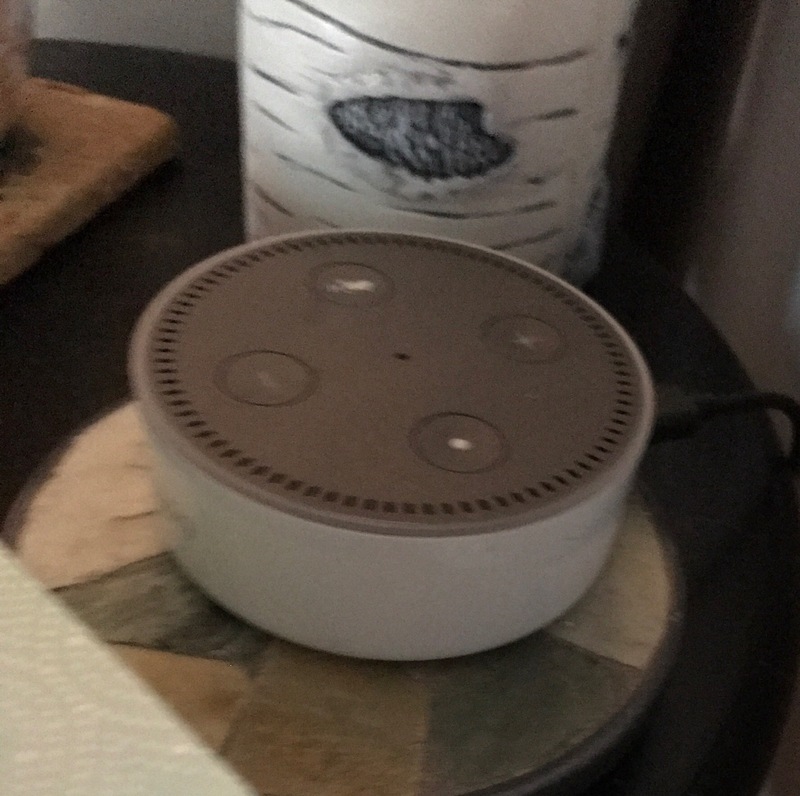 I don’t know if it was because I had more experience setting up the devices, the fact it was later in the day, the different router, or the fact I was now running the Alexa app on a Generation 4 iPad, but I had no problems activating the three Echo Dots. Under normal circumstances I would give the far edge to the Echo Dot, but as I said earlier I think the discrepancy in setup success might have been caused by outside factors. Under normal circumstances the procedures to activate the devices are identical, which is I was surprised about the discrepancy. I would like to say this should have been an even match but given my issues activating the Echo on Christmas morning I will give a slight edge to the Echo Dot. Most people will want to use the Echo and Echo Dot as a BlueTooth Audio Speaker so let me talk about that feature first. To pair your Bluetooth device to the Echo or Echo Dot you’ll need to activate the speaker’s pairing feature in the Alexa app and then search for the Echo on your Bluetooth equipped smart device. The process of Bluetooth pairing is identical on both the Echo and the Echo Dot and in both cases it was painless. Once paired, you can connect your Bluetooth device at any time by selecting your speaker from your device’s Bluetooth menu. Once paired, how do the devices sound? I’ve tested the Echo with an iPhone 5, iPhone 5s, iPhone 6s, and a third gen iPad. Meanwhile I’ve tested the Echo Dot on an iPhone 7 and LG V20 device. Audio on the Echo sounded incredible, regardless of the device paired to it at the time. I’ve tested it on music, podcasts, YouTube video and they all sounded great coming out of the Echo. Meanwhile, the Echo Dot’s speaker didn’t sound much better than the audio coming out of the iPhone 7 or LG V20 without amplification, which was disappointing. Now, I know the Echo Dot can output audio to a seperate speaker or headset using either Bluetooth or its AUX port, but in my opinion, that kind of defeats the purpose of the device in the first place. The Echo Dot is intended to be smaller than the Echo, so adding a second speaker to it is an added cost and has the side effect of taking up more space on a shelf or table. Plus, if I already had a quality Bluetooth speaker to stream audio from my smart device on, I might as well just connect my smart device directly to the better wireless speaker and not even bother pairing my device to the Echo Dot! Edge to the Amazon Echo. Since getting the Amazon Echo for Christmas, Alexa has quickly become the other woman in my life and I love customizing her features. You can enable all-new features for your Echo or Echo Dot in the Alexa app, including expanded news sources and actual games. That’s right, you can actually add features to Alexa just as easily as you install new apps to your smart device. However, since Alexa is run on the Amazon Cloud, your Echo and Echo Dot will never run out of memory so you can enable all the features you want. If you’re unhappy with Alexa’s default news sources (by default she will pull news from NPR), you can change them in the Alexa app under the Flash Briefing setting. That way you can add other news sources like CNN, CNBC, CNET, BBC and The Daily Show. I recommend some trial and error while testing different news sources as you discover which news format and order you prefer, but eventually you’ll find something you’re happy with. For new users who want to play games on Alexa I recomend enabling “The Wayne Investigation”, an official Batman Alexa game developed by Warner Brothers. There are also a few independent games inspired by pen and paper RPGs which look like a lot of fun, but I haven’t had the chance to play them yet. So is there a difference between the two? I’m sad to say there is. When doing Alexa queries on the Echo Dot I would frequently notice a pop or pause during its responses. Since the device was pretty new, I chocked this popping up to internet buffering and not a speaker issue. As a long term audio guy, there is nothing I hate more than hearing pops in my audio playback. In fact this is partially why I will never understand the obsession over vinyl. Meanwhile, after literally hundreds of different Alexa queries on a full sized Amazon Echo, I never noticed a single pop or crackle during Alexa’s responses. And yes, before you ask we were using the recent Echo Dot hardware revision which we were told should have been as fast as the full sized Echo, and we noticed the popping on at least two seperate devices. We’re still not entirely clear on the exact source of the Echo Dot’s pops. It could be the speaker, the processor, or internet buffering but since I had no such issues with the full sized Echo, I am giving the edge to the Amazon Echo. At this point I would normally talk about the Echo’s Smart Home features. I do know that Alexa can interface with a wide range of Honeywell Thermostats for home climate control, and smart bulbs for home lighting, but we don’t have access to that kind of hardware here. After doing a lot of research in the Alexa app, it looks like there aren’t any specific Smart Home apps or features locked to one specific device or the other. Sadly this section will have to be left blank for now, if we ever decide to update this article in the future this may get changed but for now we will call this section even. With that all out of the way, let’s talk about price. I’ve seen prices for the Amazon Echo range from $120-$150 US depending on where you bought it from. Mine was purchased off the Home Shopping Network (HSN), and we paid $129 for it. Meanwhile, the Amazon Echo Dot retails for $50US on Amazon. I know there’s just no comparison in price, you could buy three Echo Dots for the price of one Echo and many people (including us) have done exactly that. Edge to the Echo Dot. I know it may be more expensive but when it comes to quality and simplicity out of the box I have to give the overall edge to the Amazon Echo. Once I set it up, it just worked, and it never stopped working. Meanwhile, the Echo Dot, while cheaper and equipped with all the features of its big brother, is not as polished a device as the full sized Echo. We believe the Echo is worth the higher price. When Halo 5: Guardians launched on the Xbox One in 2015 Microsoft streamed a massive live event which was declared the biggest live stream of its time. Now, in early 2017, they’re doing it again, and this time it is going to be for the multiplatform RTS game Halo Wars 2. Halo Wars 2: Live starts 4PM PST on February 16th. We can expect early previews for the game, behind the scenes information about its development and a whole lot more. Halo Wars 2 is coming February 17th, 2016 to the Xbox One and Windows 10. A major update for Dead Rising 4 was just released on the Xbox One, adding some new difficulty modes and support for new DLC content including Street Fighter costumes. The new difficulty modes are included free with the patch, so you won’t have to pay extra to unlock them. If you previously had the most recent version for the game already installed, the patch should take up a little under 7GB. Dead Rising 4 is out now on Xbox One and Windows 10.